Double-crossing, graphic violence and misguided beliefs are not a part of the story of the birth of Christianity. A distrustful conman derived by a greedy politician and his supporters is not the backstory behind the New Testament. 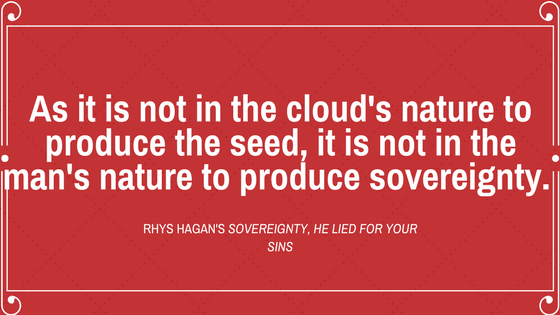 However, in Sovereignty, He Lied For Your Sins, this thought-provoking piece of historical fiction explores a different story about the Son of God. It is written from the narrative perspective of a Roman banker named Amphion Gallius whose family owns and operates several churches. Like his father before him, Amphion is desperate to make a name for himself – which is where his idea of profiting from faith comes from. A beneficial contract is extended to Amphion by Pontius Pilate, and he needs someone to become the face and the voice behind the revival of his family’s churches. Jesus Christ is a skillful speaker with a local following when he’s blackmailed into joining the revival. He’s forced to pose as the Son of God and convince the citizens of Judea that he is the Messiah they’ve been waiting for. Amphion’s brother Marcus is in charge of creating the New Testament while his other associates partake in staging the “miracles” that Jesus performs to convince the locals to give back to their church. An assassination attempt turns water into wine right before the eyes of dozens of wedding guests. The Sea of Galilee goes from a dwindling supply of fish to an overnight array of Gobiidae. Capsized boats of men are rescued by walking on water. What starts as a small manipulation of people’s faith turns into something far beyond the control of Amphion and his associates. Author Rhys Hagan presents themes that are daring and controversial to the faith of Christianity. He challenges the origins of the faith, the way corporations and governments take interest in religious beliefs and the detriment that misplaced beliefs can have on a person. The brutality and the significant people of the era are clearly well-researched while the challenge to Christian faith is bold. It can be seen as powerful, or disrespectful, but it can’t be denied that it tests the reader and still manages to hold suspense despite its well-known non-fiction counterpart.